who benefits from vitamin D3? 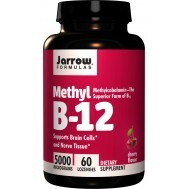 The World Health Organization (WHO) recommends a daily intake of 1000 iu or more for good health. The ones to benefit from this advice are typically men and women who have office jobs, men and women over 40, men and women with a darker skin of African Arabian or African descent, men and women with skin disorders caused by vitamin D deficiency. Optimal vitamin D levels are a must for a beautiful elastic skin, a good prostate function and strong and healthy bone structure. A low vitamin D status has also been linked to low testosterone levels and vice versa. 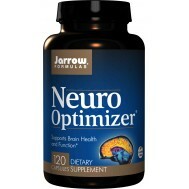 how does the active ingredient function in this product? Fat-soluble Vitamin D3 is converted by the kidneys into the hormone calcitriol, the active form of Vitamin D3, which affects a variety of target tissues, including bone, intestine, muscle, brain, skin and immune cells. Calcitriol enhances calcium and phosphorous absorption and stimulates the synthesis of osteocalcin, an important structural protein in bone. Also, calcitriol is involved in proper cell differentiation (changing of cell function), including in prostate cells. Vitamin D is a fat soluble vitamin that is obtained from food, sun exposure, and dietary supplements. Once vitamin D is ingested or synthesized in the skin, it undergoes two hydroxylation reactions in the body, first in the liver to calcidiol (25-hydroxycholecalciferol), and then in the kidney to calcitriol (1, 25-dihydroxycholecalciferol). Vitamin D is critical for healthy bone development, remodeling and maintenance. It is also known to play a key roll in the maintenance of many other organ functions. Two forms of vitamin D, vitamin D2 (ergocalciferol) and D3 (cholecalciferol), are available in supplements and fortified foods. 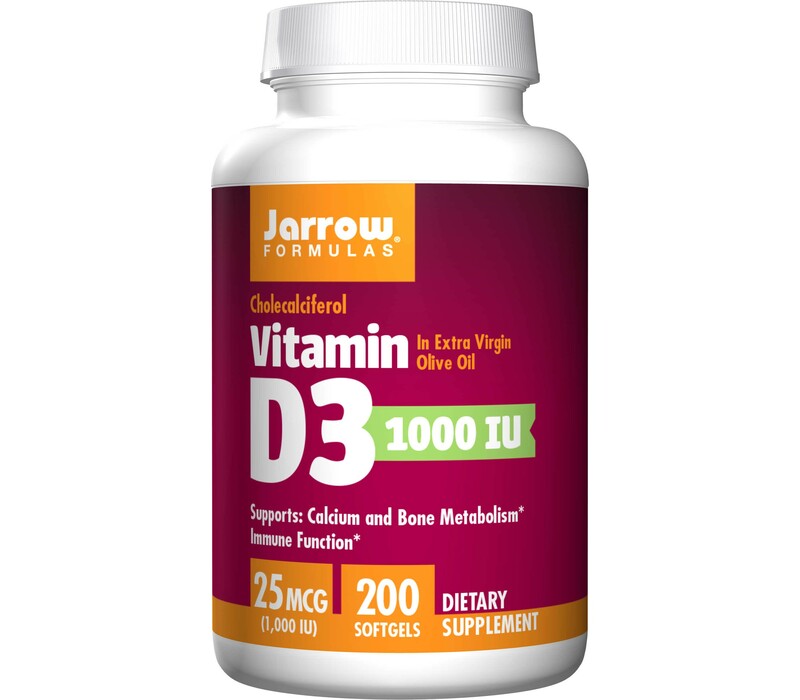 Although both forms can raise available vitamin D in the body, vitamin D3 produces three times the amount of available vitamin D metabolites with a longer retention time and higher activity potential. 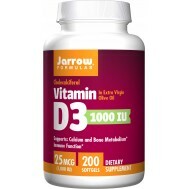 Jarrow Formulas Vitamin D3 utilizes only cholecalciferol, the superior kind of vitamin D, to ensure the delivery of a high quality, more bioavailable form of vitamin D.
Vitamin D deficiency in the U.S. Obtaining sufficient vitamin D from food and daily sun exposure can be difficult for many people. The US National Health and Nutrition Examination Surveys (NHANES) have reported that the average intake of vitamin D has been declining and that many children and adults in the United States are likely to be vitamin D deficient. This trend may be due to increased body mass index (BMI), reduced dairy consumption, lactose intolerance, milk allergy, increased use of sun protection, and vegetarianism. In breast-fed infants, human milk alone is not sufficient to provide the required amount of vitamin D. The American Academy of Pediatrics (AAP) recommends vitamin D supplementation in both infants and mothers. Women and older individuals also tend to have vitamin D levels that are lower than recommended levels. In the population above age 50 in particular, this may be caused by a slowed or compromised metabolism and poor absorption of vitamin D.
Adequate vitamin D is essential for optimal health. Supplementation of vitamin D with Jarrow Formulas Vitamin D3 can contribute to the required daily vitamin D intake and thus promote healthy bones, skeletons, immune function, and cell protection in both the young and the old. Although a precise mechanism has not been elucidated, vitamin D has been shown to support balanced cellular growth and differentiation. Vitamin D has an ability to modulate production and stability of proteins and associated factors that are critical for healthy cell proliferation, apoptosis, and differentiation. Additional pre-clinical and clinical studies are underway to discover further benefi ts of vitamin D in sustaining well-controlled cell function and growth. 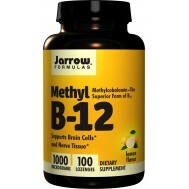 Vitamin D has been shown to regulate both immune-promoting and immune-suppressing effects of immune cells and factors. Interactions among vitamin D receptors and other molecules on the immune cells enhance the communication between various signaling pathways, resulting in efficient and appropriate immune responses. In addition, this basic vitamin may play a signifi cant role in cardiovascular health by regulating blood pressure (through balanced hormone secretion), heart and vessel muscle function, and normal immune response. A growing body of research on vitamin D also suggestes benefits of this vitamin to normal mood and blood sugar regulation, and overall mortality and well-being, although additional studies are necessary for better understanding of the modes of action. Because of limited availability of the economical size, you will receive two of the smaller sized bottles in February and March. 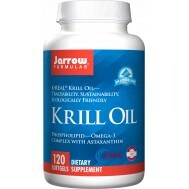 always consult you physician when undertaking a supplement program to verify if your medication interferes with this supplement. To prevent chronic deficiency an intake of 400iu is recommended, while optimal intake for adults is somewhere between 1000 and 2500 iu/day. Take the lower amount in summer, when you get into the sun often or when you have a fair skin type. Take the higher amount in winter, when you spend most of your time indoor or when you have a dark skin type.